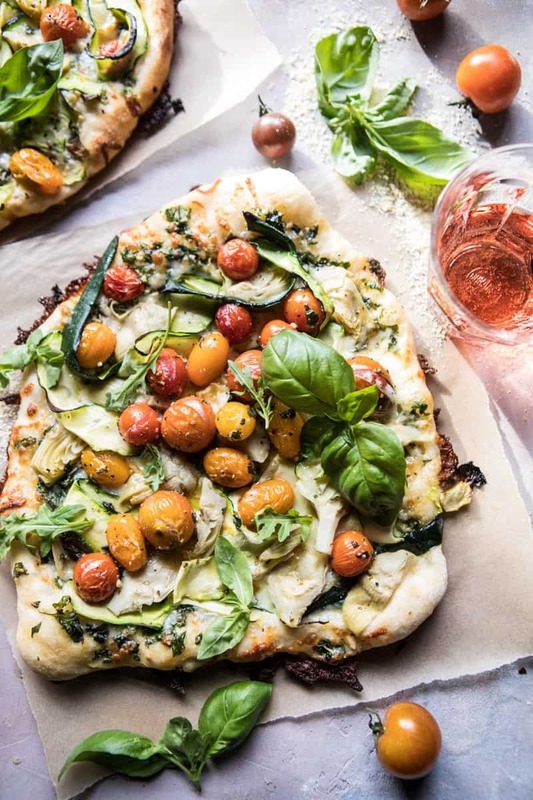 Because Wednesdays are better with cheesy pizza…more specifically, this burst Cherry Tomato, Artichoke, and Zucchini Pesto Pizza. <– truth. I know that this title is kind of a mouthful, but I wanted to get it all in there! 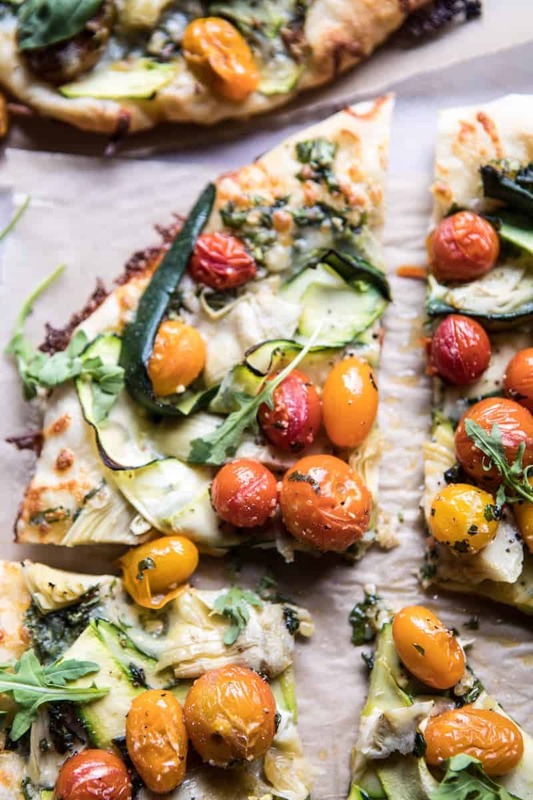 This is one cheese filled, veggie filled, pizza and I love it! I cannot deny that my mind has turned to all things SUMMER. With Memorial Day now behind us, and the sun still shining until at least 8PM, I am in all-summer go mode. I know we still have until June 20th for the season to officially arrive, but guys, I am so ready, and I’m betting that you are too! Or at least I’m hoping so. 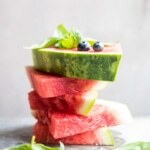 I’m counting on you guys to be down with my summer inspired eats! Speaking of summer…little sister, Asher, gets out of school on Friday! Do you guys remember that feeling of school’s out for summer? I can literally still feel it, it was probably one of my favorite, most anticipated feelings, EVER. Over the weekend I went for a quick little bike ride with Asher. She is dead set on me taking her to Italy for a summer trip, and I’ve got to say, the girl is starting to convince me that I somehow need to make it happen. First of all, I think it’s the cutest thing that my eight year old sister wants to go to Italy with me, although she did just watch Mary-Kate and Ashley’s movie, When in Rome, so that could have a little something to do with it. She’s promised me that if we go she will try anything at least once…new cheeses, different pizzas and pastas, and frittatas! She especially wants to see Rome. Yes, the Colosseum, all the ruins, and the Vatican City (she did an extra credit report on it…did you know it is the smallest country in the world – only 2 miles wide). She also wants to go to Milan (she is very much the fashion queen), visit the sea, and eat lots of Nutella and pasta…maybe not in that order. How can I turn her down? I mean, it is in Europe, but it’s not like she’s twisting my arm to go. I’ve always wanted to visit…hello to all the fresh burrata and stone fired pizzas. BUT…it’s just a crazy busy summer, and planning a trip to Italy is kind of a big undertaking. Any suggestions for me? If we do go, where must we visit? Where must we stay? Where must we eat? Let me know!! Dying to hear your thoughts guys!! OKOK. Double anyway? <–got so off track there. While we contemplate this Italy trip, I think we should eat pizza. You know, to prepare! Duh. Ok, but in all seriousness, this is kind of my first summery pizza of the season. Fresh heirloom cherry tomatoes, garden zucchini, late spring artichokes, and tons of homemade basil pesto. Nothing too fancy, but yet so delicious. I had a ton of pesto leftover from these antipasto skewers, so I used it as the base for my pizza. I then topped it with a generous amount of provolone and mozzarella cheese. I loved the combo of sharp provolone and melty mozzarella. It was the perfect cheesy balance. For the veggies, I added zucchini ribbons and marinated artichokes. The zucchini ribbons cook up quickly and get a nice char on them, and the marinated artichokes crisp up on the tops just slightly, which I love. Tip: when buying jarred artichokes, always go for the marinated ones. They are not rubbery like canned artichokes and are packed with flavor. For the tomatoes, I tossed them with olive oil, a little garlic, thyme, salt and pepper, then I spooned them over top of the pizza. I added them to the very top so that they can burst in the oven. They are SO good that way, trust me! Finish the pizza off simply, by adding a little fresh basil…and DONE. Could not be easier. 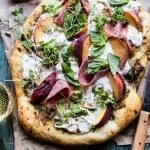 I can totally see myself making this pizza all throughout the summer. It’s healthy, colorful, fast, and just really, really good! 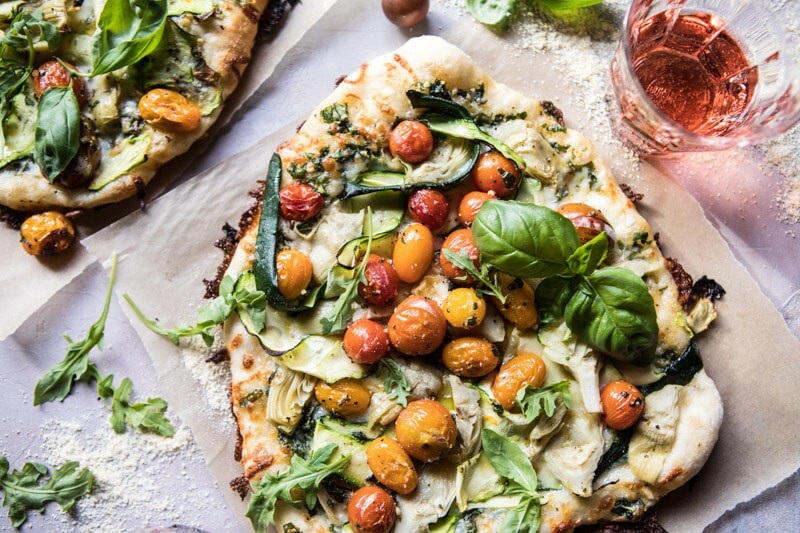 I love the combo of burst tomatoes with lightly charred zucchini…and of course the provolone and mozzarella are pretty yummy too. Each bite is filled with goodness, which is how all pizza recipes should be. The real question…would the Italians approve of my pizza? Hmmmm, thinking I’ll need to take that question on to Italy. You know, for research purposes. 2. On a lightly floured surface, push/roll the dough out until until it is pretty thin (about a 10-12 inch circle). Transfer the dough to the prepared baking sheet. 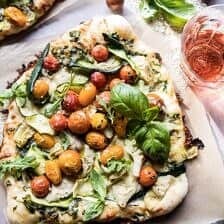 Spread the dough with pesto and top with provolone and mozzarella. Add the zucchini and artichokes, you might not need all the artichokes. 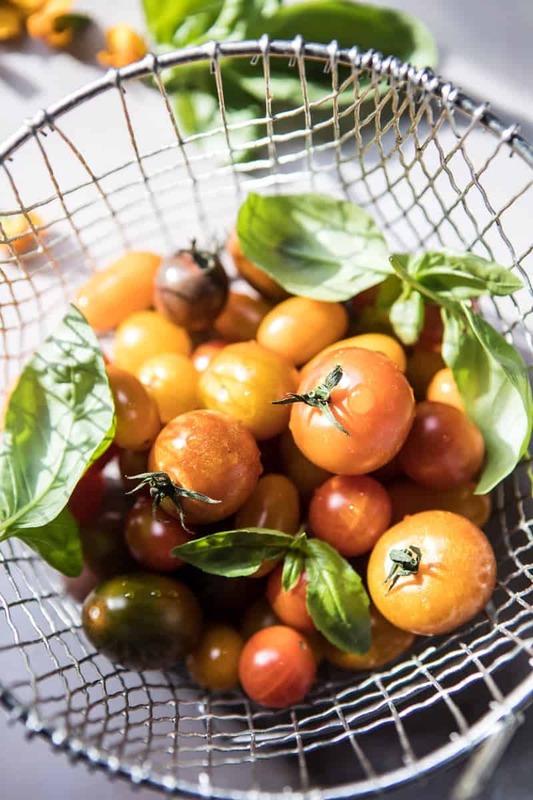 Add the tomatoes to a bowl and toss with the olive oil, garlic, thyme, salt and pepper. Spoon the tomatoes over pizza, drizzling any oil left in the bowl over the pizza as well. 3. Transfer to the oven and bake for 10-15 minutes or until the crust is golden, the cheese has melted and the tomatoes have burst. Remove from the oven and top with fresh basil and arugula. Slice and eat! And just like that, Wednesday night is looking so damn good. Che figata! Right, you can send a couple of these my way anytime now, ‘kay??? Haha sounds good!! Thank you Ruth! Ah that sounds so amazing! Totally want to go there. Thank you Julia!! Yes! Go to Italy! Take lots of pictures! Eat lots of good food! I totally want to! The food sounds so amazing! I love Rome, their history and of course their food. I highly recommend eating in this little cute neighborhood called Trastevere Rome. They have the most amazing food and it’s very traditional in a small cornerstone street and narrow walkway. The whole experience is wonderful. Wow that sounds amazing Carlos! Thank you so much for this suggestion, I will have to see it when if I go! Definitely do a trip to Italy! Rome is amazing and my favorite city so far (I live in Italy – not a local though). Venice is a must see as well and they have an awesome juice bar called ESN Frulala – I go to Venice just for that sometimes. 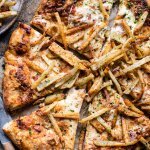 Most places have pizza with French fries on them which is a fun nontraditional one to try out. I would love to meet you if you make a trip here! My brother Red actually tried that pizza in Milan and said he loved it!! Thanks so much for the suggestions Celina, it would be awesome to see non-touristy places! I hope you love it! Thanks Sandra! You will absolutely love Italy, how I wish I could go back. Best champagne risotto I have ever had – I still dream about it! Sorrento & Capri have the largest lemons I have ever seen, they are the size of grapefruits. Pompeii & the Colosseum are inspiring. You will have a blast. Wow the size of grapefruits?! That is crazy! Thank you so much Kathi! 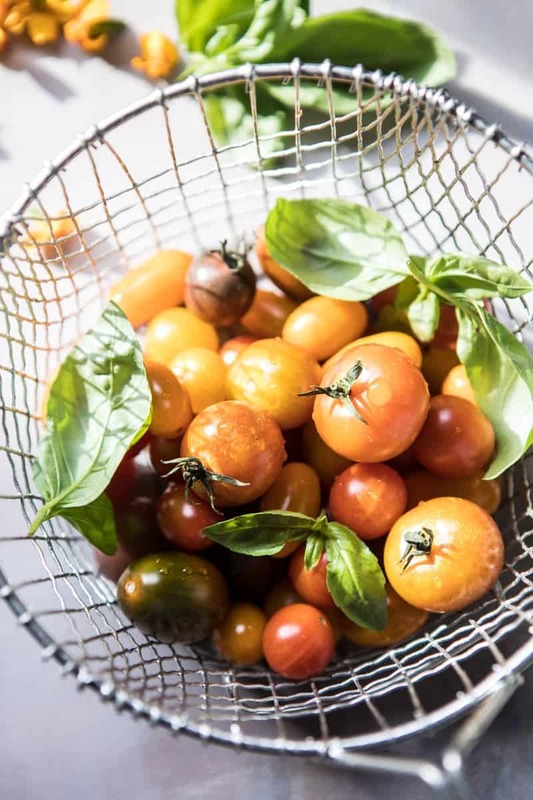 We installed a greenhouse in our garden this spring and I already planted lots of heirloom tomatoes and different kinds of basil – so this recipe is definitely happening as soon as we can harvest something! That is amazing! I hope this recipe goes amazing for you Vera!! I studied abroad in Verona, Italy and lived with an Italian family for 4 months. If you’re looking for an adorable town, Verona is a lovely place to go 🙂 Firenze was probably my favorite city to visit, but if you have a lot of time, the Amalfi Coast is literally breathtaking and I would highly suggest visiting there! Awh that must have been an amazing trip! Thanks so much for the suggestions, I will have to check out these cities. I heard great things about the Amalfi Coast as well! Thanks Hannah! Go to Bologna. I took the tour above and it was the best tour I’ve ever been on. You go to Modena and see how Parm, real balsamic, and Prosciutto is made. Then you go to an agratourism farm for lunch. You will need a wheelbarrow to wheel you out after all the food you will eat. You can take the parm and balsamic back with you to the states. The owner even got an FDA food license, so you can order off his website and they will ship it to you. Get a ROMA pass online. It gets you into 5 attractions without waiting on line, and saves you money. At the Coliseum, if you didn’t have a ROMA pass you waited 2 hours, and we waited 20 minutes. These are awesome tips! Thank you so much Lauren!! Tieghan go to Italy with your sister! You will have memories for the rest of your life. I really think I need to haha! From all the suggestions, it is sounding even more amazing! And thank you Susan!! Oh you should go! For a hike enthusiast like you cinque terre is a must! Also if you stop by in Florence (you definitely should) make sure to eat a bistecca fiorentina! When eating sweets in italy -> always take the uggly once, pretty food is just made for tourists. For bestest ice cream, visit san gimingano! And try to avoid cities like rome and Florence in august, its too hot. And tell asher Milan is not that great. Its more European than italian, and you can find fashion any where else too. And go! Visit toscana and liguria! Oh wow thank you for this! Really glad to know these things incase we decide to go and I will obviously have to check out that hike! Thank you so much Lea, have a nice week! I totally forgot: you have to visit Volterra (twilight City). And again: cinque terre is so beautyful. I am so overdue for a pizza night and this is exactly what I need in my life! 🙂 And of course you must go to Italy! You guys would love Florence, and taking day trips throughout Tuscany. I also loved hiking along the Cinque Terre. Rome is beautiful, and I absolutely love Venice! Milan is a very cool city, and from there, it’s only about an hour up to Lake Como, which is perfect for a day trip or a weekend. Thank you so much for this! If we decide to go I will have to shoot you an email to get some more info on where to go and see! Thank you so much Laura!! I’d suggest to go everywhere and eat everything 🙂 Puglia is amazing, Volterra is stunning and whole Tuscany as well. Sicily – wow. So many things to see, experience and try. And it is worth it! Go! Ah this is making me more excited, like I need to go!! Thank you Marta! I’ve seen photos of Capri and it looks like the most beautiful little island!! Taking a boat around sounds so amazing. Thank you for the suggestions Caroline! Yay for the end of school for Asher! I remember being so excited too Tieghan! Italy? So fun! Pizza is the perfect way to get in the Italy set of mind! You two would have a blast there. It’s beautiful. Looks to see and do and eat!! If we end up going it would sure be a fun trip! Thank you Mary Ann! 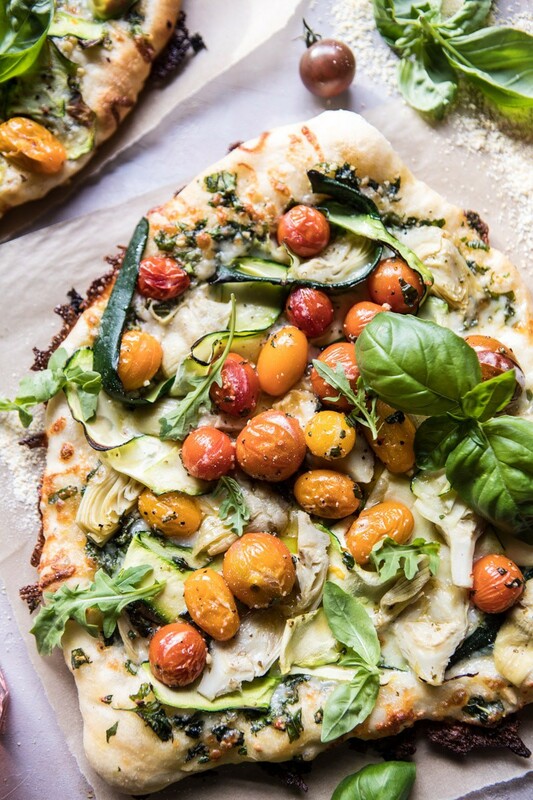 I’m all over this pizza .. love all the tomatoes and veggies. . this is summer right here! Delicious! Thank you Alice, so glad you are liking this pizza! Glad you think so! 😊 Thanks Andrea! I am so going to use this combo my next pizza night. Great post and beautiful photography. Have fun in Italy! I hope the pizza turns out awesome for you & you love it!! Thank you! it’s funny reading about your desire to go to Rome because I’m staying in Italy for two weeks right now and just had my last night in Rome!! If you go to the Vatican, you must go to Pinsa ‘Mpo- oh my gosh, the pizza is to die for!! super hole in the wall, local place that has incredible pizza combinations and it’s a personal pizza! (I got one with pumpkin flowers, artichokes, three types of cheeses, and more- soooo good). Also, go to Frigidarium- best gelato in the city (get the bacio- SO RICH). There’s this great hole in the wall salad and pizza place across the street that has tons of buddha bowls and unique pizza as well!! Make sure you buy all the tickets for the things you want to see online, because it’s hours of waiting if you don’t 🙂 if you have any questions, I’m happy to help!! Oh wow sounds like a dream!! I hope you had a ton of fun in Italy while you were there! I am really thinking I need to go haha. Thank you so much Danielle! You make the most amazing pizzas, Tieghan! 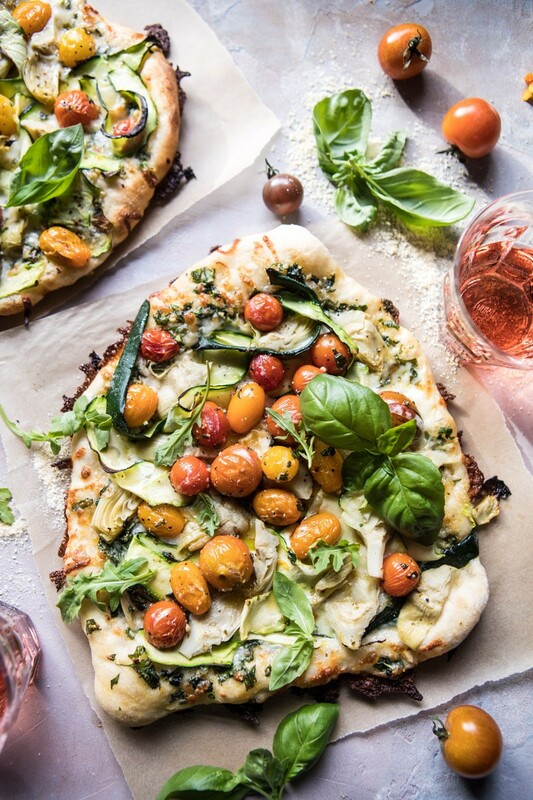 My kind of pizza – especially if it’s topped with a huge arugula salad! 4 years ago today, I was in the middle of a trip to Tuscany. Best food I have tasted and best people I have met! I stayed in Lucca, it’s pretty quiet there (up in the mountains). Most of the chefs are involved with the Slow Food movement, and we met the guy who initiated it. He owns a trattoria with the biggest piece of cured meats imaginable. Super amazing prosciutto there! I also went to the top of a marble mountain to learn how the make lardo from fatback (from a pig). They even serve dessert lardo with chocolate shavings. Oh, now you have me reminiscing big time! I hope you make it to Italy veryyyy soon! Oh wow sounds like a fun trip! Thank you Ashley, I hope you love this pizza! Burst tomatoes and basil might be one of my favorite things about summer. Bring on this pizza! Ooo me too! Glad you are liking this! Thanks Gina! Italy is amazing! I will be in Tuscany in a few weeks myself…and it never gets less exciting to go! Just expensive to fly to from Canada (as most places are). The one point that I would make about Rome (and any major city in Italy), is that the summer is an absolutely crazy time to go! It is the peak of tourist season, and everything is extra expensive, extra busy, and extra touristy. I know that your sister is in school, but if you could take her out for a week in mid-September that might be ideal. Everything goes back to feeling a little more local and authentic, the temperatures are less scorching, and things are a little less busy. Regardless, any time is an great time to visit Italy…and as the commenter above mentioned, Travestere is amazing! That is so great to know about the tourist season. Definitely would want the experience to be authentic and local and not feel touristy. Thanks so much Katie! I hope you have fun in Tuscany!! Awh thank you Elizabeth! I seriously need to try all the food there- it all looks so yummy! Your welcome, thanks so much! Hi! Thank you so much, I am really glad you enjoy my posts and recipes! I made this recipe last night and loved it, but felt that the basil pesto (the homemade recipe) was a bit overpowering. I left the cheese off though, so that could have offset it. I did 450 for 15 minutes and it cooked PERFECT. I actually ate it cold the next day and found it tastier than when it initially came out of the oven- thank you! Hi Brittany! I am so glad you enjoyed this recipe! Thank you! 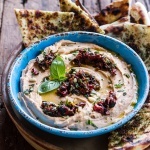 What a wonderful recipe, very Informative article, Amazing article.